WARNING: This is a preview of Eye for an Eye. 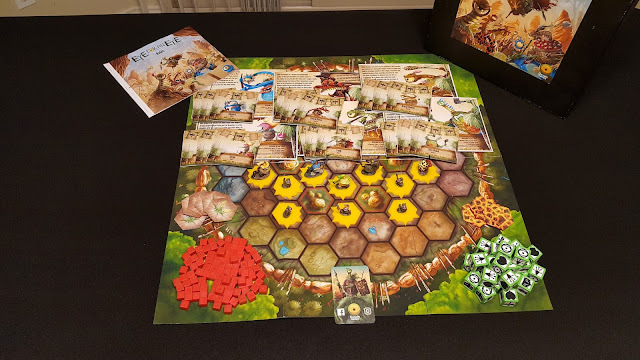 All components, artwork and rules are prototype and subject to change. Many years have passed since the wars in Crespusculum ended, and many Occulites suffered and more died during that time. Towards the climax of the wars the chiefs of the different tribes gathered together to figure out how to stop all the carnage and the idea of the Arena was spawned. From that moment on when disputes arose between the tribes, the chiefs would enter the Arena and settle it in mortal combat. From the publisher: "In Eye for an Eye, players take control of a single combatant in a real time fight to the death. Each round is played to a soundtrack that goes for no longer than five minutes, with the best of three rounds winning. Eye for and Eye is played in real time. There are no turns, it is constantly every player’s turn. 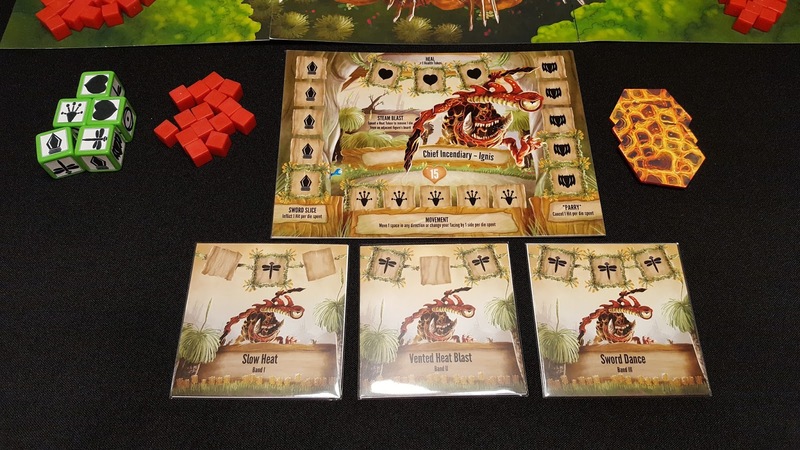 The frantic positioning and the back and forth attack and defence of characters is controlled by speed rolling, quick decision making and dice allocation. Players roll and reroll dice, allocating what they want without waiting for other players". Players begin by placing the Arena board in the center of play. 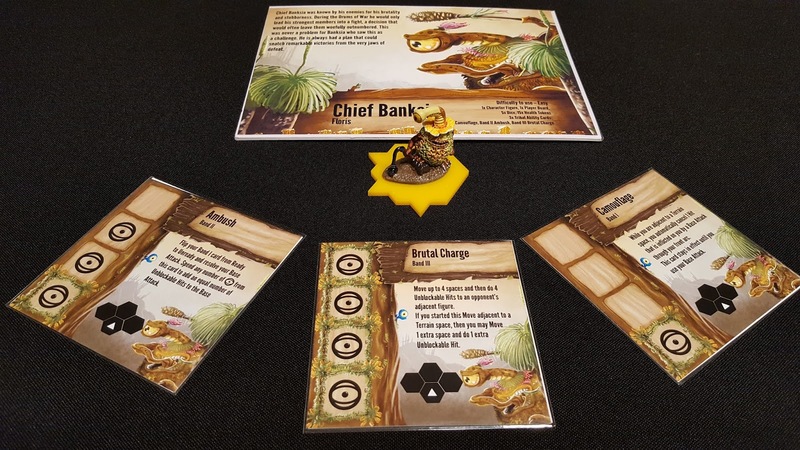 Next, each player takes a Hero board and places it in front of them along with that hero's special Tribal Ability cards (if playing the advance game), five action dice, and life points equal to the value indicated on the Hero board. 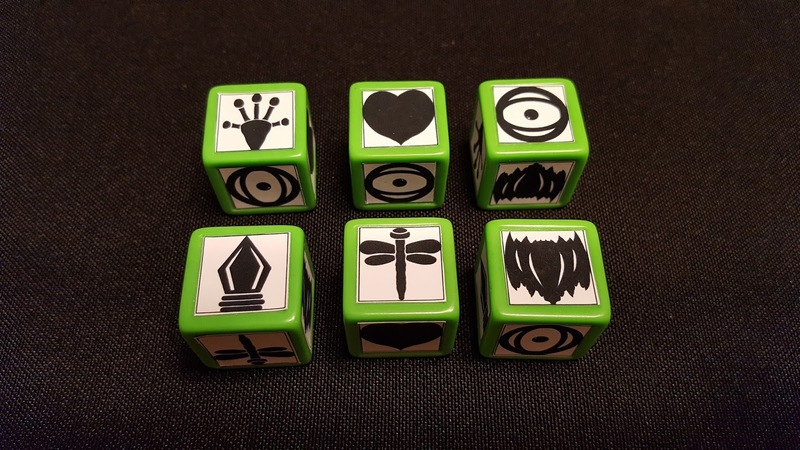 Players then randomly select a Flower token to determine their starting position, then places their Uno Ojos (one eyed) miniature on that space. Lastly players will choose a soundtrack for the round (or set a timer for five minutes) and they are ready to begin. The game is played over three five-minute rounds which are played in real-time. 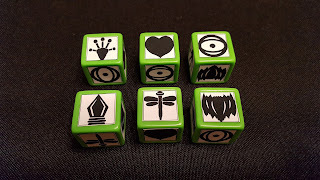 Meaning, each player will be rolling their Action dice, assigning them to action spots on their Hero board, then resolving those actions all at the same time! 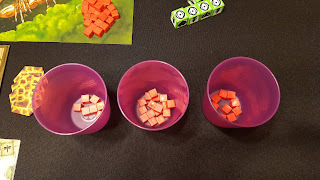 Once the round starts, the player will roll all five of his dice, decide which ones to assign to his board, then he will continue to re-roll the remaining dice. 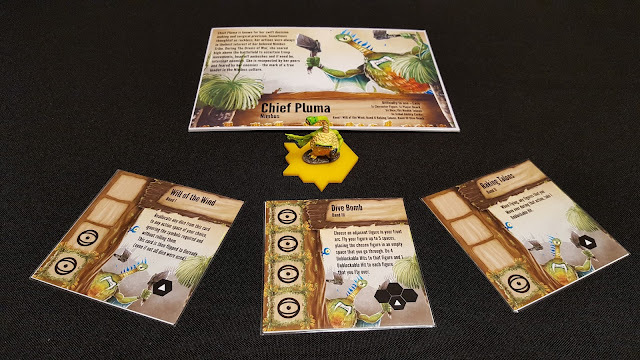 Once ready, he may activate any of the dice he has on his board to execute an action. Actions include; moving, fighting, defending, healing, readying, and activating any special actions. When a player activates an action he must call it out in order for the other player(s) to know what is happening. Also, when attacking and defending, it helps players determine the order and outcome of the actions. 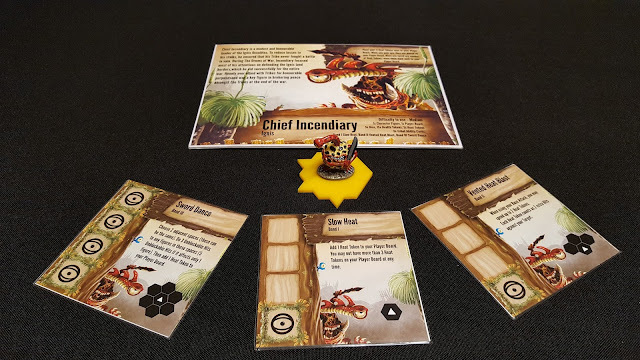 Ignis Chief player board with special Tribal Action cards beneath. For example player one has three movement dice on his player board and decides to activate them, so he calls out "move three". 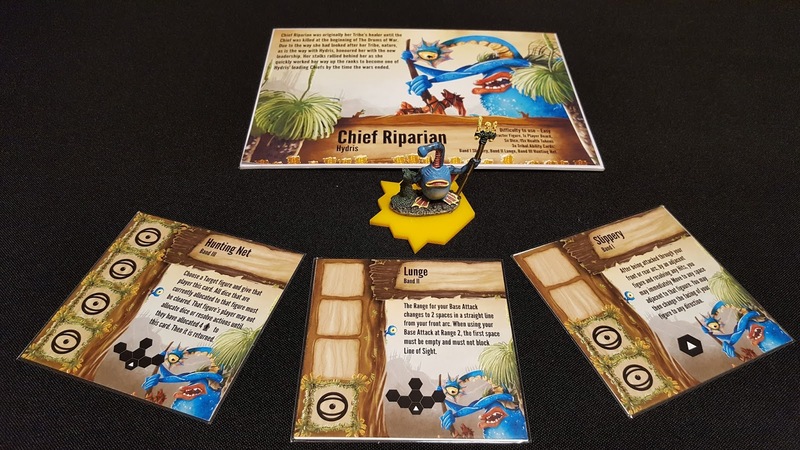 He then removes the three dice from the Hero board and moves his Cycloptic Swashbuckler three spaces according to the movement rules, which could also include orientating the figure in another direction. All other actions work in a similar manner. When attacking, a player will call out how many hits are happening, then the defender will call out how many of the hits are deflected (if any). If there are more hits then deflections, the player who is defending will take that many health points from his pile and add them to his opponent's cup, for end of round scoring. That is it, really. Roll dice, assign dice, and resolve dice. Players will do this continually for the five minutes. If a player loses all their health points before the time limit ends they are "knocked out" and in a two player game it would end the round. If more than two players are playing, the round would continue until all but one player was knocked out or the timer ends. Players will score at the end of each round based on how they ranked. The rank depends on the number of enemy health tokens they have in their cup at the end of the round compared to the other players. For example the player with the most health tokens in a three-player game will get 4 points, second place gets 2 points, and third place will receive 1 point. These points are carried over from round to round and the player with the most points at the end of the third round wins! There are a couple modes of play, including everyone for themselves and team vs team. I could also see many more variations being added like capture the flag or king of the hill. Since I wasn't sure a written explanation would work very well I decided to do a quick two-player runthrough of a single round to give you a better idea of how it plays. 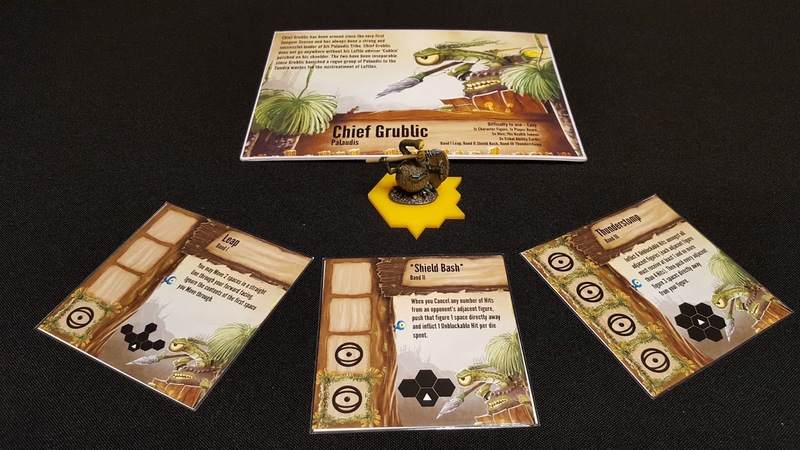 In June of 2017 I had the pleasure of reviewing Dawn: Rise of the Occulites, courtesy of Eagle-Gryphon Games, which is a beautiful and inventive tabletop miniatures skirmish game. See that review HERE. When Ben started sharing news of a follow up title I reached out to him immediately. What can I say? I love these little One Eyed Wonders. I was super excited to see how the game play compared and differed from its predecessor. Although I really enjoyed Dawn, it is sometimes hard to get to the table due to the overall playing time. 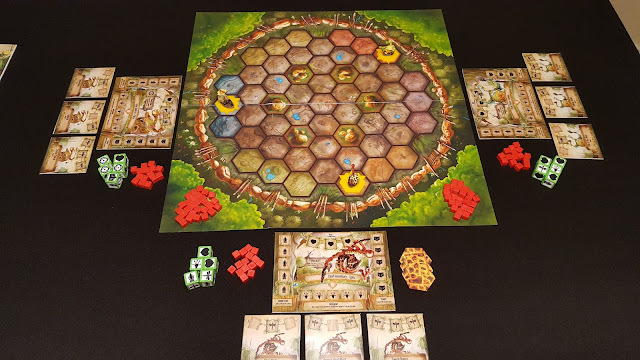 Eye for and Eye is billed as a quick 5 to 15 minute game, and if you add setup time and final scoring into that you may hit 30 minutes for a full game. This is perfect for most gaming nights as it allows for multiple plays, tournament play, or time for other games if you can pull yourself away from these cute Single Slit Slayers. Although both are tabletop skirmish style games, they both play very differently. Dawn is a card-driven turn-based game for the most part, whereas Eye for an Eye is all about dice rolling and fast action. The real-time aspect creates a significant amount of tension and chaos that can lead to many interesting situations and decisions. Sometimes things are moving so fast that you literally have to fly by the seat of your pants, at least if you are of the Nimbus Tribe. 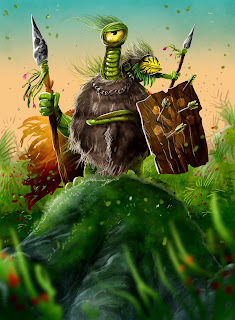 Eye for an Eye, and the entire Occulite universe, is richly thematic and has a wonderfully detailed back story which you can read HERE. Boy, our Monospec Mates have evolved quite a bit over the years. The different tribal chiefs and tribal abilities really adds to the variety and replayability. After having the game for several weeks now I still haven't been able to play all the characters with their various abilities. And after talking to Ben, it sounds like there will be several more chiefs to choose from. 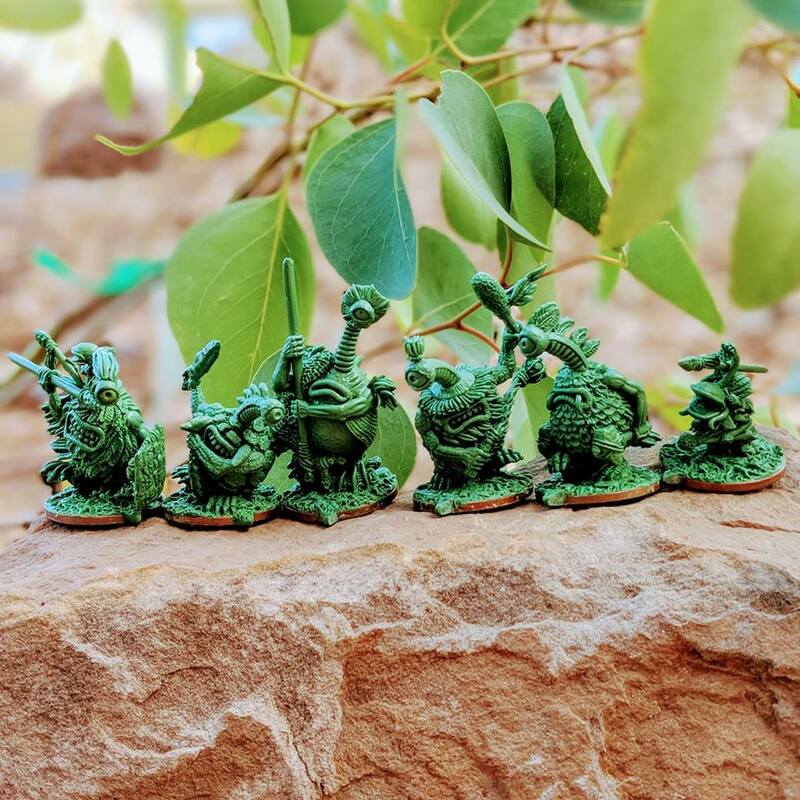 I can also image the influence from Kickstarter backers will create even more! The artwork for Eye for an Eye is another facet that really draws you into the game, from the 2D artwork on the board and cards to the 3D sculps of these Peculiar Peepers, it is quite amazing. Although what I was sent is a prototype, the artwork is still solid. Ben did a great job on the artwork for Dawn: Rise of the Occulites, however he decided to hire out the artwork for Eye for an Eye to artist Mihajlo Dimitrievski. Mihajlo has worked on such projects as Cavern Tavern, Chocolate Factory, and a recent hot release - Architects of the West Kingdom. Note: The minis in the images above are not final (in fact they are from Dawn: Rise of the Occulites). However I believe the ones below show what they will be like (unpainted). There is so much to be said here. The gameplay is quick and easy to figure out (i.e. not a lot of working parts). That being said, with everything happening at the same time it keeps you on your toes. The artwork and theme are incredible. The variety is great and only going to get better with the Kickstarter campaign. Most importantly, Ben is very invested in this game and the universe he has created, which means it will be amazing once it is finished and he will support it 100% moving forward. That could mean follow up Occulite games and expansions, something I think a lot of gamers are looking for in today's market. Unfortunately this is not a game for everyone; the real-time aspect will cause problems for many younger and maybe some older players alike. Also, if you are not playing with honest people you will have your fair share of table flipping moments. Hey, don't look at me! 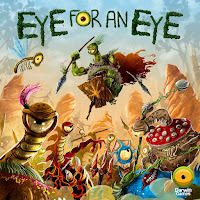 Eye for an Eye is a delightful blend of strategy, tactics, and straight up fast-paced Ameritrash brawling. I love it! 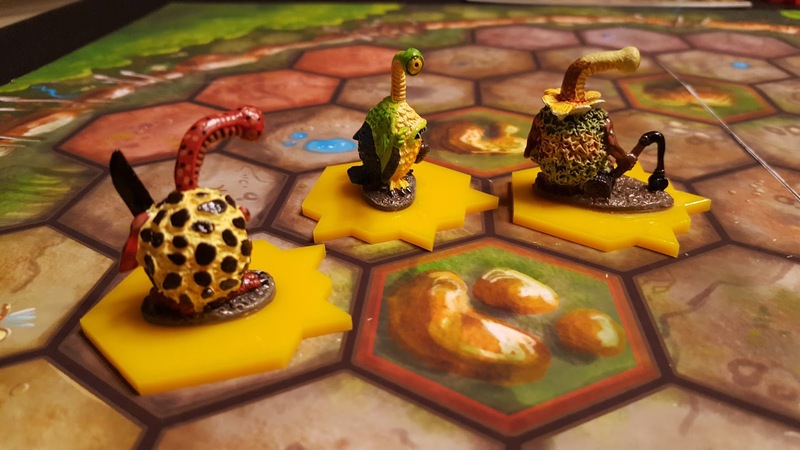 Skirmish style games like Memoir 44, Battle Lore, and Incantris with a realtime aspect like Escape: The Curse of the Temple will love Eye for an Eye. Eye for an Eye is on KICKSTARTER between now and May 24, 2018. 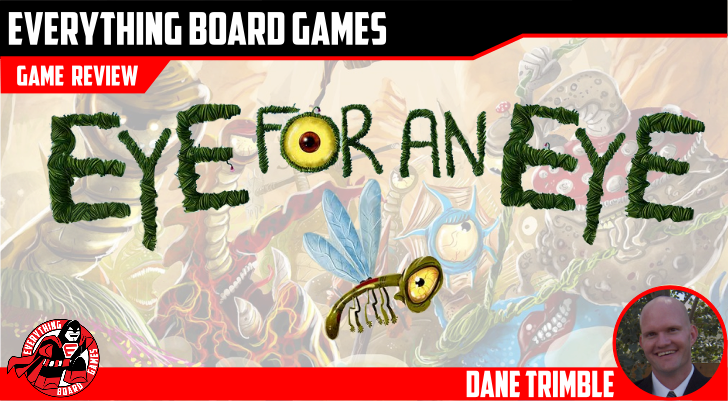 Dane is an Advertising Manager for a national magazine by day and a husband, father of four, and board gamer by night (and mornings). 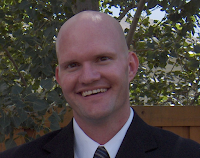 He has a passion for board games and believes board games help bring families closer together while providing kids a unique way to learn many diverse skills. And he thinks they are down right fun!! !